First Openly Transgender Recruit Signs Contract to Join the U.S. Military! “(The Pentagon) confirms that as of February 23, 2018 there is one transgender individual under contract for service in the US Military,” Major David Eastburn, a Pentagon spokesman, said. The person has signed a contract but not yet started basic training. A number of federal judges – in Baltimore, Washington, Seattle and Riverside, California – issued rulings blocking Trump’s ban. The judges said the ban would likely violate the right under the U.S. Constitution to equal protection under the law. Late last year, transgender people were allowed for the first time to enlist in the U.S. military, after the Trump administration decided not to appeal the rulings. Last week, U.S. Defense Secretary Jim Mattis provided his recommendations to the White House on transgender people serving in the military. Advocates have said they believe dozens, if not hundreds, of transgender people will seek to join an estimated 4,000 already serving. We wish the individual well in their military career! 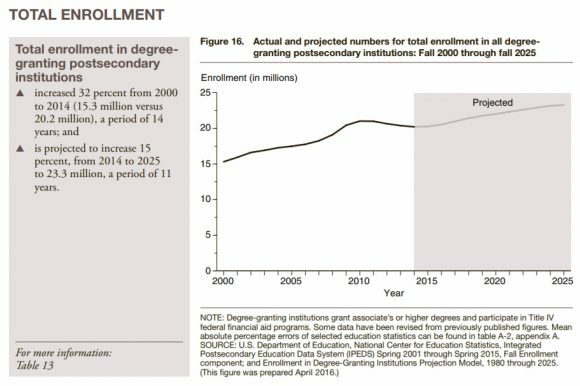 USDOE IES: College Enrollment Projections Expected to Increase Over Next Eight Years But Not Equally Across the Country! “The number of high-school graduates in Maine is already projected to decline by 9 percent through 2025, according to data from the Western Interstate Commission for Higher Education. But the financial crisis in 2008 also caused a 13-percent drop in the birth rate nationwide that will hit higher education in 2026, according to Nathan D. Grawe, a professor of economics at Carleton College and the author of a new book, Demographics and the Demand for Higher Education. Grawe’s research indicates that Maine, New Hampshire, and Vermont could lose as much as 23 percent of their likely college­goers by 2029. The situation in the article is not understated. 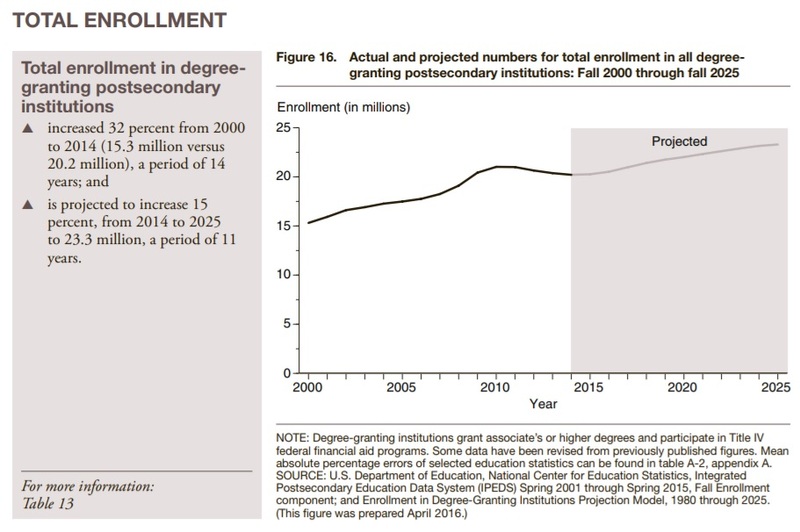 However, across the country, enrollments are expected to increase 15 percent through 2025 according to data from the USDOE Institute of Education Sciences published in 2017 (see graphic above). 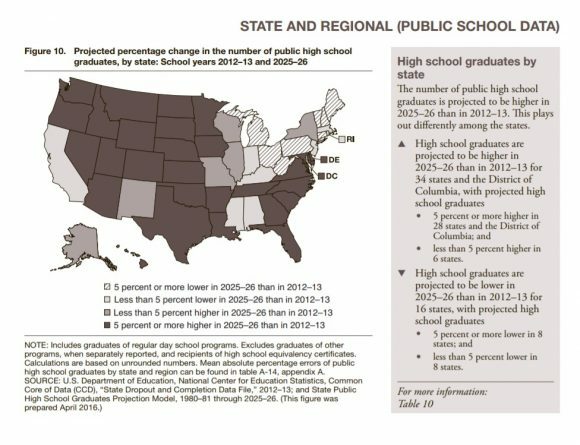 There is no conflict in the two scenarios because the Northeast and New England is expected to see declines in high school graduates (see graphic below) while the rest of the country is projecting increases. Regardless of where colleges are geographically located, all will have to pay attention to costs and finances as the push to make higher education more affordable will create pressures on the entire postsecondary community. Disaster Capitalism Hits Higher Education in Wisconsin! Rachel Ida Buff, a professor of history at the University of Wisconsin-Milwaukee, had an article last week in The Nation, reviewing the current state of public higher education in Wisconsin. The title of the piece, “Disaster Capitalism Hits Higher Education in Wisconsin,” is an apt description of the state of affairs at the University of Wisconsin System. Ray Cross, the president of the System is trying to reconcile a well-funded assault on public institutions with the state’s deep blue sea of support for accessible higher education. College mergers, faculty layoffs, tenure, and shared governance are at stake in the Wisconsin System. It is a most difficult situation and one that is being viewed carefully around the country. The article published last Friday, appears below. It is well-worth a read! Pity Ray Cross. The formerly genial president of the University of Wisconsin System is trapped between an American Legislative Exchange Council (ALEC)–fueled state government and Board of Regents, on the one hand, and the venerable, obstinately popular “Wisconsin Idea” of accessible public higher education, on the other. What’s an ambitious university administrator to do? Strong protections for academic freedom and democratic governance have been foundational to the creation of an internationally venerated university system here. One of Cross’s predecessors, Charles Van Hise, first articulated what has come to be known as the Wisconsin Idea in 1905, declaring: “I shall never be content until the beneficent influence of the University reaches every family of the state.” With their open admissions practices and locations in small communities around the state, the UW Colleges have been a crucial realization of the Wisconsin Idea. Recognizing that “the search for truth” can be a complicated pursuit, Chapter 36 linked its lofty mission to iron-clad protections for tenure and academic freedom and affirmed the centrality of democratic governance to these pursuits. Faculty, academic staff, and students were each to have as their primary responsibility advising the chancellor in “all policies and procedures” of concern to them, as well as “the right to organize themselves in a manner they determine and to select their representatives to participate in institutional governance.” The Wisconsin Idea linked broad access to public higher education to democratic institutional conduct at the university. Both are anathema to those leading the current extremist assault. The rights and protections of the Wisconsin Idea have now come under ALEC-funded fire from Governor Walker, state legislators, and the governor-appointed Board of Regents. Adhering to the protocols of disaster capitalism, this cabal has used a manufactured crisis in public funding to justify the diminution of educational democracy. In 2015, Governor Walker announced a state budget with a $250 million cut to General Purpose Revenue (GPR) for the University of Wisconsin System: an 11 percent reduction in state support in a system already predominantly reliant on tuition revenue. At the same time, Act 55, which removed tenure and democratic governance from state statute was introduced. Both passed through the gerrymandered state legislature in June 2015. As yet, it is unclear what the merger plan will mean for the fate of these institutions, with their historic mission of broad access under the lofty rubric of the Wisconsin Idea. A recent “No Confidence” resolution by the UW Stout Student senate termed Cross’s leadership “ruinous.” If the purpose of university administration is to provide broad access to democratic public higher education, they are correct. 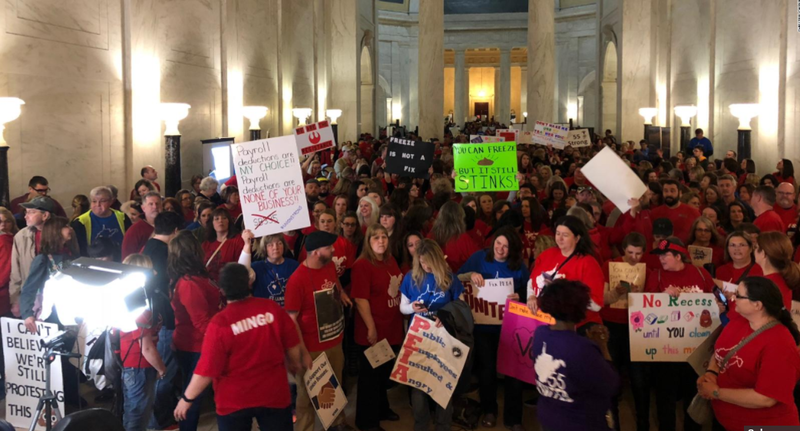 West Virginia Teachers Continue Statewide Strike: 277,000 Students Effected! 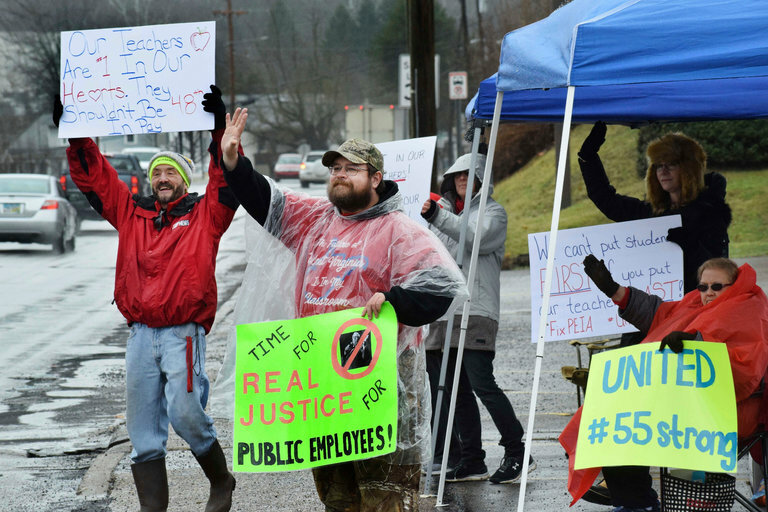 A teacher’s strike is keeping public schools closed for a third day in West Virginia. The state Department of Education’s website shows all school districts are closed in all 55 counties this morning. The strike effects more than 277,000 enrolled in 680 public schools. The strike started on Thursday after Gov. James C. Justice, a Republican, signed legislation on Wednesday that would provide teachers and school service personnel a 2 percent raise starting in July, part of an increase in salaries for some state employees. As reported by various media. Teachers and service personnel are scheduled to get an additional 1 percent raise in the 2020 fiscal year, and teachers will get another 1 percent raise in 2021. Teachers’ unions say the raises will not cover cost-of-living increases. Ms. Randolph said that teachers’ salaries had stagnated for years and that the lack of state contributions to the health care plan had meant that inflation costs have been borne by the employees, who are struggling under higher deductibles, premiums and out-of-pocket expenses. While the board of the Public Employees Insurance Agency, which administers the health care plan for state employees, has agreed to freeze rates in 2019, the teachers want a more permanent funding fix. Governor Justice said the agency’s board would work on long-term solutions to address the teachers’ concerns. “Now we need to turn our focus back to continuing public education reforms and making our state educational system the best in the country,” he said. Ms. Nester said the walkout seemed to have a lot of support from members of her community, adding that she was demonstrating in support of all state workers, not just educators. We wish our teacher colleagues well in their fight for a fair wage! Leadership Changing at Gates Foundation Postsecondary Program! In its simplest form, the strategy calls for raising the educational-attainment levels for low-income and minority students by improving the retention and graduation rates at the institutions that enroll the greatest number of such students. It also aligns with the foundation’s burgeoning plans for more spending on projects to promote economic mobility in the United States that Bill and Melinda Gates recently highlighted in their annual letter. Nonetheless, people familiar with the foundation’s work in higher education, including some current and former grantees and former program officers, say the selection of the next director could and should be an opportunity for the foundation to broaden its scope to include more support for organizations that promote options beyond traditional colleges and fresher approaches within academe. Whether Hiles’s short tenure was the result of a policy difference or a bad personnel fit, several people familiar with the foundation say her departure is emblematic of something bigger: a tension within the Gates education programs between those who favor working through existing channels and those pushing for support of educational entrepreneurs and for options that might prepare people for careers but that don’t necessarily involve college certificates and degrees. The Gates program supports groups like Jobs For The Future, the American Association of Community Colleges, the Aspen Institute, and Educause. More recently, it’s doubled down on its institution-oriented focus with grants to a consortium of 11 public colleges called University Innovation Alliance and to a collection of 29 colleges and two state systems it calls the Frontier Set. Just this week, the Association of Public and Land-Grant Universities announced it was receiving a $1.2-million, two-year Gates grant to develop a Center for Public University Transformation to help its members produce more college graduates..
Greenstein looks back on his tenure with satisfaction. “The pace of change is slow” in higher education, but that’s not necessarily bad, he said. “I actually value the reasons that we’re slow.” At the same time, other signs — like the growing rates of adoption of online education, the wider use of data-driven advising, and the way the higher-education conversation has shifted to college completion and value, not just access — are all indicators of action. “And we contributed to that,” said Greenstein. He will step down from his role on March 15 but will continue with the foundation until at least June, assessing the nature of the outside expertise that is available to college leaders who are managing change at their institutions. Greenstein said he hasn’t decided on his next career move — perhaps a college presidency, for an institution “that’s at an inflection point.” And given the current political environment, he also plans to continue speaking out about higher education. It remains to be seen whether Gates steers its present course. My sense is that there will be changes. Democratic Members of the House Intelligence Committee Release Memo Countering Claims Made by Their Republican Colleagues! Republicans on the committee, led by Rep. Devin Nunes (R-Calif.), voted earlier this month to release a memo that they said contains evidence illustrating FBI bias against Trump, meant to discredit the larger investigation. Trump later authorized the memo’s release, the contents of which largely confirmed previous reporting on the investigation rather than presenting any new bombshells. Democrats have argued that the GOP memo is purely political and relies on cherry-picked evidence and inaccuracies. The Republican-controlled committee initially voted against releasing its rebuttal, setting off drama surrounding the dueling memos. But after unveiling the GOP memo, which Republicans continually claimed was a measure of “transparency,” the committee on Monday voted unanimously to make the Democratic rebuttal public, sending it to Trump for approval. Trump said he would “accept the recommendations of the FBI” regarding the release of the Democratic memo, CNN reported on Feb. 6. When deciding to release the original GOP memo, Trump ignored “grave concerns” from the FBI, setting up a public feud between himself and the bureau’s director, Chris Wray, whom he appointed. Rep. Adam Schiff (D-Calif.), the top Democrat on the committee, said at the time that he was concerned about the White House omitting portions of the Democratic memo’s claims for political purposes. The Democratic memo will be the talk today on Sunday morning news programs and probably through the beginning of next week. Men’s Curling Team Wins First Ever Olympic Gold Medal! I have been watching the Olympic Games in South Korea for the past two weeks. There have been wins and heart-breaking defeats but in general the competition and events have been enjoyable. The grace of the figure skaters. The excitement of the skiers. The athleticism of the snowboarders. This morning I woke up at 3:00 am to watch the USA’s Men’s Curling Team play for the Gold Medal against Sweden. A week ago, the USA Men’s Team had a record of 2-4 and seemed all but out of any medal consideration but they came back with five straight wins to win the Gold early this morning with a 10-7 victory. 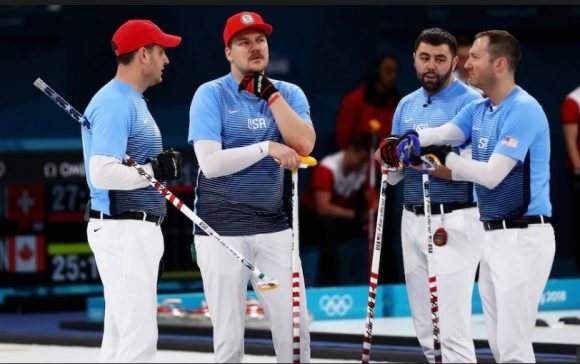 While normally the teams play ten “ends” in a game, the USA had the game rapped up after eight ends when with the last stone, John Shuster hit a shot that gave the Americans an unbelievable five points to cement the victory. Congratulations to John and teammates, John Landsteiner, Matt Hamilton, and Tyler George. Congratulations also to the Swedish Team for winning the Silver Medal. Teachers are Teachers Not Marshals! The response to his proposal was swift and negative. “If having more guns in more places made Americans safer, then we would have the lowest rates of gun violence in any developed country in the world, and the exact opposite is true,” she said, calling the notion that “the only thing that stops a bad guy with a gun is a good guy with a gun” a myth. Lastly, it should be mentioned to President Trump that there happened to be an armed sheriff’s deputy at Marjory Stoneman Douglas High School in Parkland, Florida when 17 people were killed and that he took cover outside rather than go into the building when the massacre began. The deputy, Scot Peterson, resigned on Thursday after being suspended without pay by Sheriff Scott Israel. We are all sick to our stomachs with the massacre in Parkland, Florida, and the “pathetically weak” way our elected officials including President Trump do nothing about gun violence in this country. Let’s ask someone who’s in the trenches every day what he thinks of arming teachers. “It’s hard to begin to count the number of ways this is a bad idea,” said Chris Magnus, police chief of Tucson. 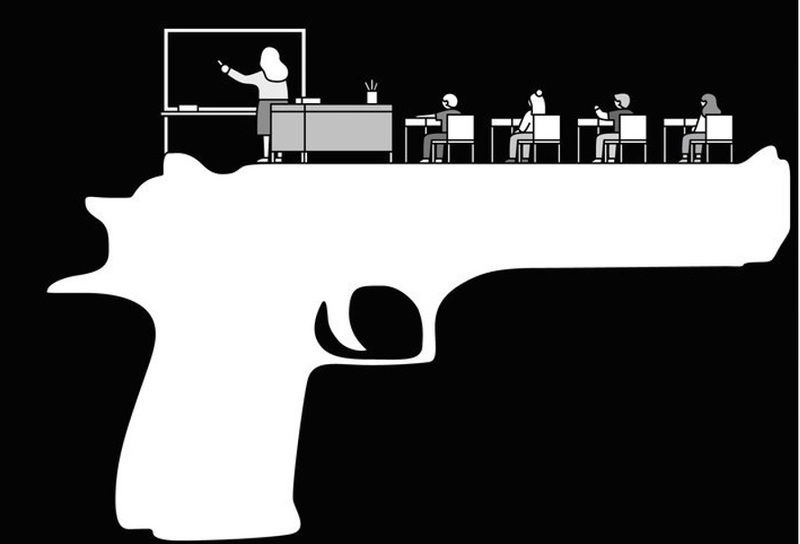 For starters, the number of gunslinging educators would be huge. In the United States, there are about 3.5 million elementary and secondary school teachers in public and private institutions. Arming 20 percent of them, as Mr. Trump suggested, would mean 700,000 or so teachers with Glocks and the like on their hips — an armed force half as large as America’s real armed forces on active duty. One can envision parents with the means to do so swiftly yanking their children out of that sort of environment. More to the point, many deranged mass murderers expect to die themselves during their killing sprees. It’s almost laughable to believe that the president’s proposal would deter them. And then there’s this inescapable reality: Teachers are human. It means they would most likely react to stress-induced fear the same as anyone else, with unintended consequences that could put even more people in peril. You want people highly trained in the use of firearms? The New York Police Department has about 36,000 of them. Generally, despite an impression held by some people, they are restrained in firing their weapons. But in high-stress situations, they’re human, too. “Police officers miss a lot in combat situations,” said John Cerar, a former commanding officer of the department’s firearms and tactics section. One problem is shooting bystanders. It isn’t routine, but it does happen. To cite just one example, from 2012, two New York officers shot and killed a gunman on a busy street outside the Empire State Building. But they also wounded nine other people who were hit directly or struck by shrapnel from ricochets. It takes little imagination to foresee a situation in which a frightened teacher, thrown into a combat situation — in a crowded space like a school hallway or classroom — wounds students in the process of trying to take out a gunman. The best way to prevent the threat of a bad guy with a gun is to keep him from getting the sort of battlefield weapon the Parkland killer used, by banning assault weapons and high-capacity magazines, and by tightening background checks. In his remarks, the mendacious Mr. LaPierre said gun restriction advocates seek to “eradicate all individual freedoms.” In fact, sensible gun laws would give people, especially children, a better chance to enjoy the first of the inalienable rights mentioned in the Declaration of Independence: life. Video: ‘Pathetically Weak’: Father Of Student Slain In Florida Denounces Marco Rubio! Guttenberg interjected, demanding the senator say if guns were responsible for his daughters death. Rubio was repeatedly booed during his response, and the jeers continued throughout the night. The arena, packed with more than 7,000 people, erupted in frustration when the senator effectively said he’d continue to accept campaign donations from the National Rifle Association. The Huffington Post in an article on last night’s CNN event reported that Rubio has received more than $3.3 million from the NRA over the course of his political career. Our hearts go out to Mr. Guttenberg and the entire community in Parkland, Florida but it is clear that the NRA and pro-gun lobbyists will do everything possible through elected officials like Senator Rubio to stop any major change to gun laws in this country. NY Times Editorial Asks: Will America Choose Its Children Over Guns? In light of student activism this past week following the killings in Parkland, Florida, The New York Times editorial (see below) this morning asks: “Will America Choose Its Children Over Guns?” As commented in the editorial, moments arrive when citizens say they’ve had enough, when they rise up against political leaders who do not speak for them and whose moral fecklessness imperils lives. We may be witness to such a moment now with the protests by American teenagers sickened — and terrified — by the latest mass murder at the hands of someone with easy access to a weapon fit for a battlefield, not a school. These kids have had enough. It appears that more of our elected representatives are listening now than in the past. Also it is not easy for those who support gun rights such as the NRA to push back too strongly against a children’s movement. Trump cannot affix a “crooked’ or “fake news” moniker on the children who appear genuinely committed to hold their representatives accountable. We wish them well and hope they can stay the course. These kids have had enough. They’ve had enough of empty expressions of sympathy in the wake of the sort of atrocities they’ve grown up with, like last week’s mass shooting that took 17 lives at a high school in Parkland, Fla. Enough of the ritualistic mouthing of thoughts and prayers for the victims. Enough of living in fear that they could be next in the cross hairs of a well-armed deranged killer, even with all the active shooter drills and lockdowns they’ve gone through. Enough of craven politicians who kneel before the National Rifle Association and its cynically fundamentalist approach to the Second Amendment. “I was born 13 months after Columbine,” a 12th grader named Faith Ward said on Monday, referring to the school massacre in Littleton, Colo., in 1999, the dawn of the modern wave of school shootings. Ms. Ward spoke to a television reporter at an anti-gun demonstration outside her school in Plantation, Fla. “This is all I have ever known,” she said, “this culture of being gunned down for no reason, and this culture of people saying, ‘Oh, let’s send thoughts and prayers’ for three days, and then moving on. And I’m tired of it. To be effective, any movement needs a realistic program, not mere emotion. Otherwise, it risks coming and going in a flash with little to show for itself. A tighter federal system of background checks is a start, to better monitor would-be gun buyers with mental illness, for example, or histories of gun violence. Such a program should also include reinstating a nationwide ban on assault weapons — a state measure died in the Florida Legislature Tuesday — and ending an absurd prohibition against using federal public health funds to study gun violence. Even President Trump, who told an N.R.A. convention last April that “you have a true friend and champion in the White House,” has signaled he might be willing to improve the system. The Washington Post reported that after Mr. Trump saw the coverage of the student protesters, he asked Mar-a-Lago guests whether he should do more about gun control. On Tuesday, he ordered that regulations be written to ban bump stocks, devices that can make an automatic weapon out of a semiautomatic. Beyond that, though, it’s hard to tell if he means business when he says he’s open to more thorough background checks. Steadfastness is not a Trump hallmark. However, if young people channeling this angry moment remain steadfast, they might not only force his hand but also stiffen the resolve of other elected officials and candidates. Horrific school shootings aside, they are vulnerable every day to gun mayhem at a stomach-churning rate. The journal Pediatrics reported last June that gunfire, each week, kills an average of 25 children ages 17 and under. A 2016 study in The American Journal of Medicine calculated that among two dozen of the world’s wealthiest nations, this country alone accounted for 91 percent of firearms deaths among children 14 and under. What the young protesters are saying now is: Put down the guns. We’re your children. How can anyone not heed their pained voices?